This entry was posted in ADC and tagged A/D-converter, analog-to-digital converter, efficiency, energy, figure-of-merit, FOM, linkedin, power, state-of-the-art, survey, trends. Bookmark the permalink. Are there any studies that attempt to relate converter technology to maturity (perhaps as expressed in volume production or price). e.g. If I am using a prototype A/D that costs $40K at some sample rate & ENOB, how long will it be before that is available at prices that could be used in production (lets say $50). I assuming cost and production quantities are related. Gregory, I’m sorry your comment was left forgotten in moderation queue for so long (only the first one requires moderation). About the study, I don’t know of anyone like that. I’ve been collecting pricing info together with the tech data for commercial ADCs with the intention of eventually studying cost-performance “boundaries” and similar. To see how long it typically takes to drop from “novelty/cutting-edge performance” to “commodity” pricing, one would need a longer sequence of historic pricing data which I unfortunately don’t have, and suspect it would take a really long time to accurately collect. With a bit of luck, someone else will have this data and feel like making the interesting study that you suggest. I want to commend you on your plots and also on your discussion of the Van Elzakker SAR paper from 2008. It was a FoM champion until ISSCC 2013 if I remember correctly. I have used some of the circuits from that paper myself. I didn’t know anyone was blogging specifically about data converters with this level of detail and I have entirely enjoyed reading what little I have had time to read this evening. My thanks to you for writing all of this and I will definitely be browsing back over here and reading quite a bit more of what you have taken the time to write down. Thank you for the kind words. Welcome to the blog! I have read your blog with great interest! I’m currently trying to understand what the ADC energy efficiency will be in 2020 (I’m working on one of the many emerging wireless 5G projects) and therefore I have also studied your predictions regarding the FOM evolution. My question is whether you plan to present (or have seen somewhere else) a view on the evolution in sample rate vs. power consumption, and ENOB vs. power consumption. 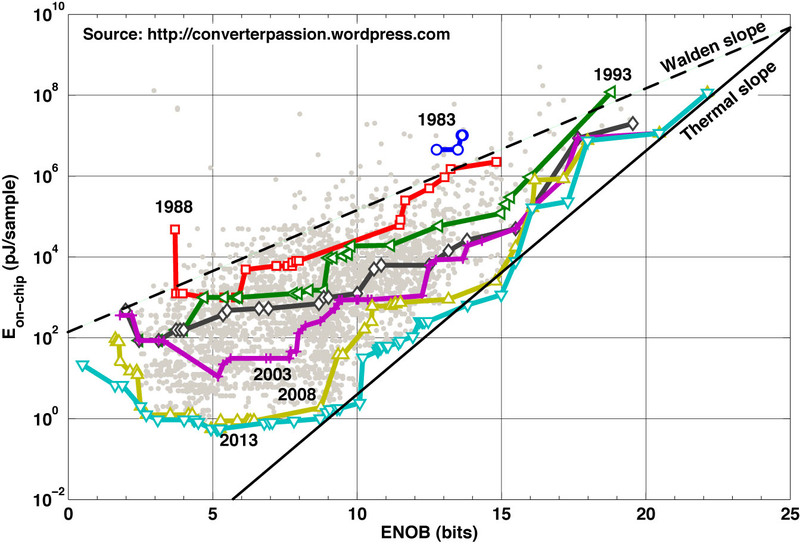 The optimum would be a 3d plot comparing both ENOB, sample rate, and power consumption. In my opinion the FOM is not so informative in this respect since an ADC with low FOM may have a very low ENOB and a high sample rate or vice versa, and in that case not be useful for a mobile phone. I expect such a 5G phone to require 10-12 ENOB and handle a channel bandwidth of at least 100 MHz. Currently I see the ADC as one of the major challenges for 5G, not only due to the ENOB and sample rate requirements (leading to possibly high power consumption), but also because there will be a need for many ADCs in each phone due to both carrier aggregation and multiple spatial streams. This will obviously affect both cost and size of the device. I look forward to reading your view on this topic. Good points. I’ll need to think a bit before producing any numbers, but I completely agree that simply a FOM doesn’t give you what you need in this case. A few graphs in response to your question could perhaps make for an interesting post. I have a few ideas that (if they tur out the way I hope) I might bounce with you directly first to see what you think.